The release of five Taliban leaders allegedly involved in massacre of thousands of Hazaras in Afghanistan during Taliban regime (1994-2001) by the United States has not only caused a grave concern among the Afghan Hazaras across the world, but has also exposed the real face of the world’s only super power which claims itself to be the champion of war on terror. The prisoner-swap deal with one of the world’s most infamous terrorist group also infers that the so-called super power has bowed down before the terrorism which it has been fighting against for the last over a decade resulting in hundreds of thousands of casualties. It is one of the foremost obligations of a state to do whatever it can to secure release of its prisoners of war, but does any law in the world permit for securing a soldier’s life at the cost of lives of thousands of innocent people? Wasn’t the US aware of the fact that the prisoners of the war who it was going to release were allegedly involved in mass killings of over ten thousand members of an ethnic group in Afghanistan? What guarantee was extended to the US that these hardened terrorists would not join the Taliban again and get involved in not only the mass massacre of Hazaras but also the fight against foreign forces including the US army in Afghanistan? The deal has raised certain questions which include as to why the US has traded five hardened terrorists with only one American, a soldier who is called a deserter. Why the US deviated from its long-standing policy of “no talks with terrorists” just to secure a soldier’s life? Why President Obama signed the prisoners transfer bill in a haste ignoring the legal requirement that his defence secretary had to give a notice to the congress 30 days before signing the bill? Was the deal really meant to secure the sergeant’s life or was he just used as an excuse to obtain some other greater goals? President Obama, his Defence Secretary Chuck Hagel and some American media outlets have defended the deal and rejected the criticism. Mr Hagel has termed the swap “a normal process in getting your prisoners back” while asserting that they did not negotiate with terrorists. He said US was dealing with terrorists and hostage taking all the time and that the release wouldn’t encourage terrorists to take American soldiers hostage or prisoner. He has justified the non-issuance of a prior notice to the congress by saying that the deteriorating health condition of Mr Bergdahl was asking for immediate action. Time magazine while defending the negotiation has stated that the US has made such negotiations many a time in the past. It claims the group (Taliban) is not on the state department’s official list of terrorist organizations and has long been a battlefield enemy in the ground war for control of Afghanistan; so, it is wrong to say that the US negotiated with terrorists. The magazine has, however, raised questions over particulars of the deal asking as why to treat such a complicated deal as a resounding triumph, complete with a dramatic White House news conference. 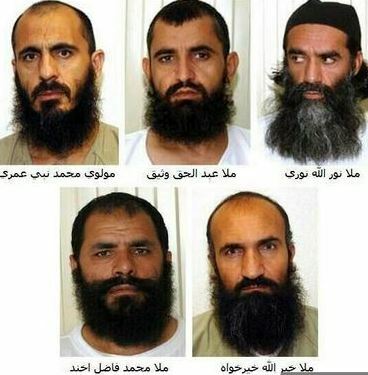 Surprisingly, both the US government and the Taliban have described the prisoners swap deal as their own victory. Nobody knows whose victory is this deal in actual. Regardless of the actual beneficiary of the deal and justifications being extended by the US administration and its supporters to defend the release of Taliban commanders, this nasty deal, in fact, suggests that the US has been defeated in its war on terror in Afghanistan and is now attempting to find a way out to save its face. Like the former USSR, Afghanistan has proved a quagmire for the US too which has consumed a major chunk of its resources besides putting serious psychological effects on its soldiers deployed there. Some political experts are very much right in their analysis that the deal has encouraged all the other terrorist groups including Al-Qaida to take Americans hostage and get their unjust demands accepted by the “champion of war on terror”. It also alludes to the shift in the US policy which is now aimed at striking a peace deal with Afghan Taliban in a bid to focus attention on China and Russia, its two major rivals. China’s increasing influence on the world market has posed a serious threat to the US economy while Russia’s recent interference in Ukraine has frightened the US of its any possible further advancement towards Eastern Europe. Moreover, the growing ties between the two countries have also alarmed the US to review its policy to ensure its supremacy in the world. What impact the latest US move will put on the world in general and on South Asia and Afghanistan in particular is the question only time will answer. But, an important impact is pretty much obvious and that is the fear of another round of persecution of ethnic Hazaras in Afghanistan at the hands of Taliban which could also spill over to its neighbouring country, Pakistan. Memories of ruthless massacre, brutal rapes, looting and ransacking of houses in Mazar-i-Sharif and Yakawlang are still hounding the ethnic minority. Hazaras have just recovered a bit from the wounds inflicted on them by Taliban regime and now the US’s act has once again paved the way for return of that reign of terror. The rapidly changing scenario in Afghanistan and reinforcement of Afghan Taliban with the help of the US, Pakistan, Saudi Arabia, Qatar and United Arab Emirates demand of Hazaras all over the world to get united and work out a joint strategy to counter the approaching danger to their survival in Afghanistan and Pakistan by Taliban. They are also required to raise their concern over the US-Taliban prisoner swap deal and get the international community involved in the matter to obtain a guarantee for their security. In other case, they must get prepared for another episode of barbarism by the bestial Taliban.